The current political economy is based on a false idea of “immaterial scarcity.” It believes that an exaggerated set of intellectual property monopolies – for copyrights, trademarks and patents – should restrain the sharing of scientific, social and economic innovations.3 Hence the system discourages human cooperation, excludes many people from benefiting from innovation and slows the collective learning of humanity. In an age of grave global challenges, the political economy keeps many practical alternatives sequestered behind private firewalls or unfunded if they cannot generate adequate profits. The pseudo-abundance that destroys the biosphere, and the contrived scarcity that keeps innovation artificially scarce and slow, does not advance social justice. Although people may have a formal legal equality of civil and political rights, serious and increasing material inequalities make those rights more nominal than real. At the other extreme, the polity explicitly grants human rights to the artificial legal construct of the for-profit corporation, a pathological institution that is solely beholden to its shareholders, and is constitutionally unable to take into account the common good. The present corporate form is a machine designed to deny and ignore negative environmental and social externalities as much as possible. Because it is driven by profit-maximizing corporations, capitalism is not just a scarcity-allocation mech­anism, but a mechanism for engineering artificial scarcities, as epitomized in the sterile Terminator Seeds developed by Monsanto.4 Such seeds are specifically designed so that they can’t reproduce themselves, which not only kills cycles of abundance in nature, it also makes farmers permanently dependent on a corporation. The above analysis suggests that any solution to contemporary capitalism needs to address these three issues in an integral fashion, i.e., production that allows the continued survival, sustainability and flourishing of the biosphere; protecting and promoting the free sharing of social innovations and knowledge; and the recognition that social and economic justice will not be achieved unless we first recognize the actual scarcity of nature and the actual abundance of knowledge and innovation. Contemporary society is generally seen as consisting of a public sphere, dominated by the state and public authorities; a private sphere, consisting of profit-maximizing corporations; and a subordinated civil society where the less privileged sectors have great difficulties in ascertaining and asserting their rights and interests. The peer-to-peer vision relies upon the three major sectors of society – the state, market and civil society – but with different roles and in a revitalized equilibrium. At the core of the new society is civil society, with the commons as its main institution, which uses peer production to generate common value outside of the market logic. These commons consist of both the natural heritage of mankind (oceans, the atmosphere, land, etc. ), and commons that are created through collective societal innovation, many of which can be freely shared because of their immaterial nature (shared knowledge, software and design, culture and science). Civil society hosts a wide variety of activities that are naturally and structurally beneficial to the commons – not in an indirect and hypothetical way, as claimed by the “Invisible Hand” metaphor, but in a direct way, by entities that are structurally and constitutionally designed to work for the common good. This sphere includes entities such as trusts, which act as stewards of physical resources of common use (land trusts, natural parks), and for-benefit foundations, which help maintain the infrastructure of cooperation for cultural and digital commons. The Wikimedia Foundation, which maintains the funding for Wikipedia’s technological development is a well-known example in the domain of open knowledge. In like fashion, the Linux Foundation and Apache Foundation support two leading software development communities. It is important to note that these entities do not function as classic NGOs that use “command and control” management and salaried personnel to allocate resources to projects; rather, they use their resources and credibility to help paid and unpaid contributors continue to develop their commons according to their own consensus judgments. Cooperative enterprises are the more prominent and developed form of private organization in this new economy. While corporations continue to exist, their operating logic is made to serve the values of the commons. Once the commons and the commoners are at the core of value creation, commoners can be expected to opt for those types of entities that maximize the value system of the commons itself. Today, the open source economy of shared innovation commons and the “ethical economy” of reformed market entities exist as separate spheres. Both need to develop and mature. An early example of this dynamic is IBM’s adaptation to the norms and regulations of the Linux community, which showed that even large, old-style corporate entities are capable of transforming themselves. We believe that new forms of cooperative and distributed property will emerge along these lines, a trend explained by Matt Cropp in his article, “The Coming Micro-Ownership Revolution.”6 Cropp’s article explains the direct link between P2P-driven declines in transaction costs and the shift to more distributed forms of ownership. The new corporate forms will no longer be based on shareholder-based ownership, but on common capital stock, held by the commoners themselves. These new entities constitute the “third commons” of “created materiality,” i.e., humankind’s productive machinery (in other words, capital), which joins the first two commons, the inherited material commons of nature and created “immaterial” cultural commons. The new forms of distributed individual property, which can be freely aggregated into collectives, emulate the free aggregation of effort already dominant in peer production rather than the older forms of collectivized and socialized public property. It can be argued that the collaborative economy is hyperproductive in comparison to the traditional industrial-capitalist modality of using a private company, wage labor, and proprietary controls such as patents and copyrights. Commons-based peer production allows rapid sharing of innovation and very low cost mutual coordination on a global scale. It also elicits passionate, voluntary engagement from large networks of contributors as well as rapidly established quick connections between emerging problems and valuable expertise. It is this hyperproductivity of commons-oriented practices and solutions that has led some observers to see commons as “out-competing” or “out-cooperating” conventional capitalism, and peer production as an attractive alternative to investments of shareholder and venture capital in private ventures. IBM is a well-known example of the realignment of a classic for-profit enterprise to the new modality of value creation. The company not only decided to use and contribute to Linux, but also to abide by the open development process of Linux, as well as the norms and rules of that community. Obviously, when we use the concept of out-competing, we stress the role that emergent peer production plays in the capitalist, for-profit system; we stress that incorporating community dynamics in the overall production process is a better and more efficient way of doing business. This is exactly the argument of the open source movement, which stresses efficiency. The free software movement, by contrast, stresses the ethical imperative of freedom in both its creative and political sense. To talk about “out-competing” allows one to build bridges to the existing mentalities prevalent in the older institutional forms of corporations and government. By contrast, to talk about “out-cooperating” stresses the “transcendent” aspects of peer production, those aspects which are non-capitalist, perhaps even post-capitalist. It stresses the open and free cooperation of producers who are creating a commons together and its transformative potential. How do we distinguish civil entities from private entities that choose to engage in some sort of social mission? On the one hand, civil entities are dedicated to the commons as a whole and exercise responsibility for its maintenance as an entity or institution, essentially based on non-market-based cooperation, and are organized as nonprofits; on the other hand, the private entities are voluntary associations of commoners that use market activity to create goods and services using a commons in order to guarantee their own individual and communal social reproduction. What joins both of these “sectors” is a common concern for maintaining the commons. Over and above the civic and market spheres is a public sphere that is responsible for the overall collective good of the whole of society (as even commoners are primarily concerned with “their” commons). The public sector establishes the general parameters and supports in which the commons operates and by which commoners can thrive. The public sector of the P2P economy is neither a corporate welfare state at the service of a financial elite,7 nor a welfare state that has a paternalistic relation to civil society, but a Partner State, which serves civil society and takes responsibility for the metagovernance of the three spheres. The Partner State is dedicated to supporting “the common value creation of the civic sphere”;8 the “market” and the “mission-oriented” activities of the new private sphere; and all the public services that are necessary for the common good of all citizens. Capitalism, on the other hand, considered by some as an “anti-market” (Braudel 1986), requires amongst other features: 1) the separation of producers and the means of production; and 2) infinite growth (either through competition and capital accumulation, as described by Karl Marx, or through compound interest dynamics, as described by Silvio Gesell). In the vision of a commons-oriented society, the market is subsumed under the dominant logic of the commons and regulated by the Partner State. It is just one of the hybrid modalities that is compatible with the commons. This vision does not preclude an evolution of society through which the market may become entirely marginal, and be replaced by resource-based economics, for example.8 The important feature is to give commoners and citizens the freedom to choose amongst different mechanisms, and to arrive experimentally at the best solutions for the allocation of scarce resources. 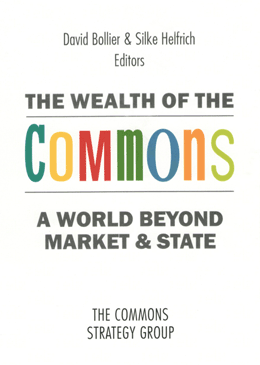 The essential characteristic of the new system is that the commons is the new core, and a variety of hybrid mechanisms can productively coexist around it, including reformed market and state forms. A commons-oriented society is not a return to premodern holism, in which the individual is subsumed to the whole, but rather a society that is based on the recognition of the need for relationality and collectivity of the free and equal individual. It is a society based on cooperative individualism rather than collectivism. Already today, in peer production, we can see how individuals can freely aggregate their contributions in a common project. This is possible because peer producers are much more in control of their own means of production, i.e., their personal creativity, computers, and access to networks. We propose to extend this vision and reality to the totality of the means of production. It should extend to citizen-peer producers so that they can aggregate the resources they need, including physical and financial capital stock, as well as coordinate their management practices and goals. This aggregation process will be guided by the need to guarantee good living conditions in a sustainable way. In this context, distributed property is a guarantee against the possible misuse of socialized common property, since the individual can also disaggregate and “fork” both his immaterial and material contributions. Most likely, the future commons society will give citizens an equal share of necessary natural resources to draw from, as well as some form of equitably distributed productive capital, giving them a certain independence from concrete and localized physical resources. The animating social force of the commons-based, P2P society is that of citizen-workers seeing themselves as autonomous producers of shared knowledge and value. This is the great contribution of knowledge workers and the hacker class to the history of the modern labor and social movements. The innovations of this new sector can and should merge with the historical traditions of resistance, creation and emancipation of the traditional working class and peasantry, as well as the progressive sectors of the other classes. One way to envisage alliances is to see merging of new constructive peer production communities in all areas of social life – which are producing the seeds of the new society within the old – with the remobilization of mass movements focused on a positive political program that is often lacking in this time of deep capitalist crisis. In other words, the convergence of the communities dedicated to the “construction of the new” and “resistance to the old” provides the energy and imagination for a new type of policy formulation, one that can recreate a global reform and transformation movement. Bollier, David. 2009. Viral Spiral: How the Commoners Built a Digital Republic of Their Own. New York, NY. New Press. Botsman, Rachel and Roo Rogers. 2010. What’s Mine is Yours: The Rise of Collaborative Consumption. New York, NY. HarperCollins. Brown, Marvin. 2010. Civilizing the Economy. A New Economics of Provision.Cambridge, MA. Cambridge University Press. De Ugarte, David (no date). “Phyles: Economic Democracy in the Network Century.”http://deugarte.com/gomi/phyles.pdf. —————. (no date), “The Power of Networks.” http://deugarte.com/gomi/the-power-of-networks.pdf, Retrieved, October 20, 2011. —————. (no date), and Pere Quintana, Enrique Gomez, and Arnau Fuentes. “From Nations to Networks.” http://deugarte.com/gomi/Nations.pdf. Gansky, Lisa. 2010. The Mesh: Why the Future of Business is Sharing. New York, NY. Penguin Group. Greco, Thomas. 2009. The End of Money and the Future of Civilization. White River Junction, VT. Chelsea Green. Hecksher, C. and Adler, P. 2006. The Firm as a Collaborative Community – Reconstructing Trust in the Knowledge Economy. New York, NY. Oxford University Press. Helfrich, Silke, ed. 2009. Genes, Bytes and Emissions: To Whom Does the World Belong? Heinrich Böll Foundation. Hoeschele, Wolfgang. 2010. The Economics of Abundance: A Political Economy of Freedom, Equity, and Sustainability. Gower Publishing. Hyde, Lewis. 2010. Common as Air. Revolution, Art, and Ownership. New York, NY. Farrar Straus Giroux. Kane, Pat. 2003. The Play Ethic: A Manifesto for a Different Way of Living. London, UK. Macmillan. Kleiner, Dmytri. 2010. The Telekommunist Manifesto. Institute for Network Cultures. Krikorian, Gaelle and Kapczynski, Amy, eds. 2010. Access to Knowledge in the Age of Intellectual Property. New York, NY. Zone Books. Lessig, Lawrence. 2004. Free Culture. New York, NY. Penguin. O’Neill, Mathieu. 2009. Cyberchiefs: Autonomy and Authority in Online Tribes. London, UK. Macmillan/Pluto Press. Raymond, Eric. 2001. The Cathedral and the Bazaar. Sebastopol, CA. O’Reilly. Schor, Juliet. 2010. Plenitude: The New Economics of True Wealth New York, NY. Penguin. Stallman, Richard. 2002. Free Software, Free Society. Boston, MA. GNU Press. von Hippel, Eric. 2004. Democratizating Innovation. Cambridge, MA: MIT Press. Walljasper, Jay. 2010. All That We Share: A Field Guide to the Commons New York, NY: New Press. Wark, McKenzie. 2004. A Hacker Manifesto Cambridge, MA. Harvard University Press. Weber, Steve. 2004. The Success of Open Source. Cambridge, MA. Harvard University Press. 1.See also the essay by Michel Bauwens on peer-to-peer production on pp. 375–378. 2.See also the conversation between Davey, Helfrich, Hoeschele and Verzola in Part 1. 3.Beatriz Busaniche, among other authors, describes how this happens in Part 2. 5.See also Gerhard Scherhorn’s proposal in Part 5 to design a commons-based competition law. 7.See Antonio Tricarico’s essay on the financialization of natural resources in Part 2. 8. In peer production and shared innovation commons, the value is created in a common pool by the contributors, and not by individuals and corporations acting in a private capacity to sell commodities in a marketplace. 8.In resource-based economics, resources could flow directly to the place of need, or be exchanged through barter or ledger systems, i.e., without recourse to money. It could be argued that a combination of networked cooperation, with open book management and transparency in accounting and production, makes the use of money for the exchange of resources obsolete. Feudal tribute systems are an older example of such money-free exchanges.